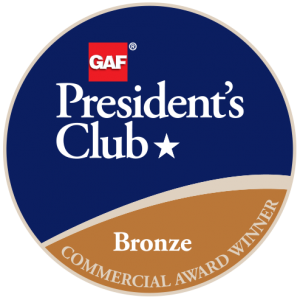 Tecta America Amarillo CS of Amarillo, Texas, has received the most prestigious contractor award GAF offers: The GAF President’s Club Award. This highly coveted award recognizes Tecta America Amarillo CS as one of the “elite of the elite” commercial roofing contractors in the United States. To become a Master Select(TM) Contractor–a status that less than 1% of roofing contractors nationwide are able to achieve–a candidate must demonstrate proper licensing, maintain insurance (in states that require it), have a proven reputation, and show commitment to ongoing professional training. Founded in 1943 and doing business in the Amarillo area since 1960, Tecta America Amarillo CS was founded with the simple goal of being the best in the commercial roofing market. Capable of handling any project without regard to size or complexity–from small roof repairs to new roofing to reroofing–the company’s dedicated service crews handle anything from small-leak investigation and remediation to full roof restorations. Customer-service oriented, Tecta America Amarillo CS has the constant goal of achieving quality work for quality customers.